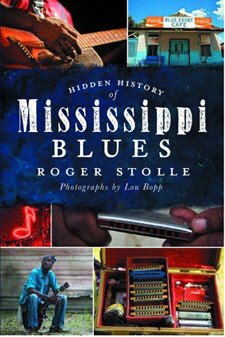 The Delta Blues Museum will host a reception and book signing for Roger Stolle, author of Hidden History of Mississippi Blues on Wednesday, October 5, 2011 from 5:00 to 7:00 pm. Meet the author, buy a signed book, and enjoy music and refreshments. Travel through the hallowed juke joints and cotton fields with author Roger Stolle as he recounts the history of Mississippi blues and the musicians who have kept it alive. Some of these bluesmen remain to carry on this proud legacy, while others have passed on, but Hidden History of Mississippi Blues ensures none will be forgotten. Roger Stolle owns Cat Head Delta Blues & Folk Art, a blues store in Clarksdale, Mississippi, as well as his own music and tourism marketing service. He is a Blues Revue magazine columnist, WROX radio deejay, XM/Sirius radio correspondent, and Juke Joint Festival cofounder. Through his Cat Head Presents record label, Stolle has produced several critically acclaimed blues CDs/DVDs; he coproduced the award-winning film M for Mississippi: A Road Trip through the Birthplace of the Blues. Hidden History of Mississippi Blues is his first book. He was educated at the University of Cincinnati and worked for thirteen years in the advertising and marketing world prior to entering the music business. Lou Bopp is an award-winning commercial location photographer who has traveled the world on assignment for clients such as Time Warner, Deutsche Bank, McCann-Erickson, Amex, Sports Illustrated, Y&R and many more. His subjects range from celebrities to CEOs, musicians to technicians. For more information contact the Delta Blues Museum 662-627-6820. The Delta Blues Museum is located at #1 Blues Alley in downtown Clarksdale. This newsletter is supported in part by funding from the Mississippi Arts Commission, a state agency, and, in part, from the National Endowment for the Arts, a federal agency. Sign up for our newsletter "Keeping the Beat"